Reichsfuhrer SS – Heinrich Himmler was Adolf Hitler’s most loyal henchman and one of the most feared men of WWII. Surprisingly, he had only one problem… He had no stomach for murder! When the Reichsfuhrer-SS becomes physically ill during the execution of Russian POW’s on the Eastern front in 1941, ruthless, careerist SS General Hans Shellenberg rats Himmler out to the Fuhrer, Adolf Hitler. Hitler tests his loyal Heinrich, forcing him to commit the murder of a Polish prisoner named Danuta with his own hands… thus awakening the Monster within him that will horrify the world for generations to come! Himmler may please his Fuhrer in 1941, but what awaits him after he commits suicide in 1945 is nothing less than Hell itself. See what happens when Himmler meets Erebus, the gatekeeper of Hell! 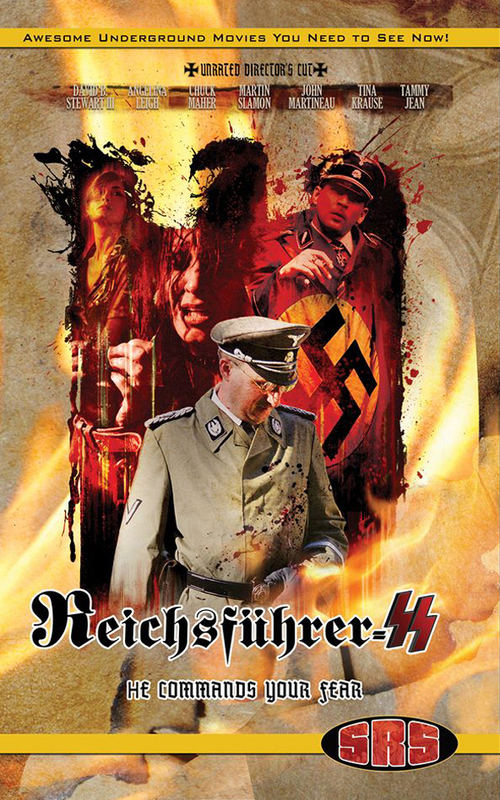 See the nightmarish suffering that awaits the infamous Nazi leader who murdered millions! This entry was posted in Uncategorized and tagged Demonic, Hitler, Horror, Limited Edition, SGL Entertainment, SRS Cinema, VHS. Bookmark the permalink.